Do you love the smell of live Christmas greens in your home? And the beautiful mix of evergreens that can be added to decor? Well, I do too! But I don’t like cleaning up dropped needles and changing the sap laden water in my arrangements that are scattered around my home. I knew there had to be an easier way to bring the beauty of Christmas greens to StoneGable without the mess. And there is! Faux greens. 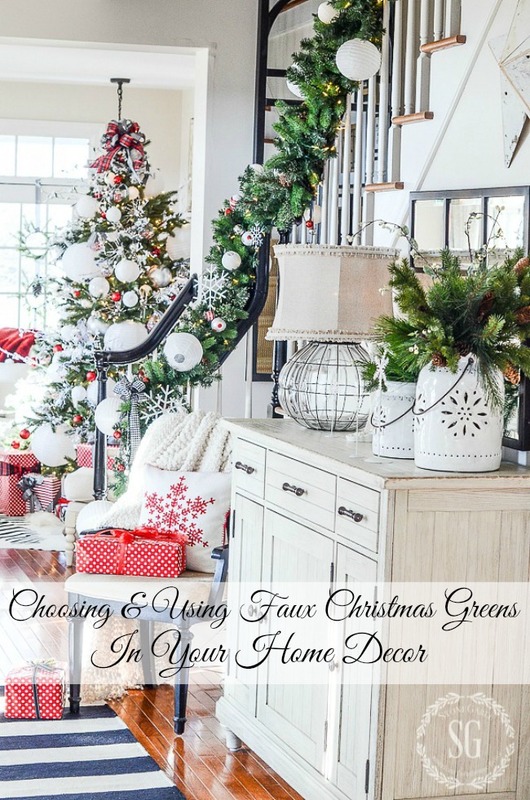 Let me show you how to choose and use faux Christmas greens so they make your home merry and bright! 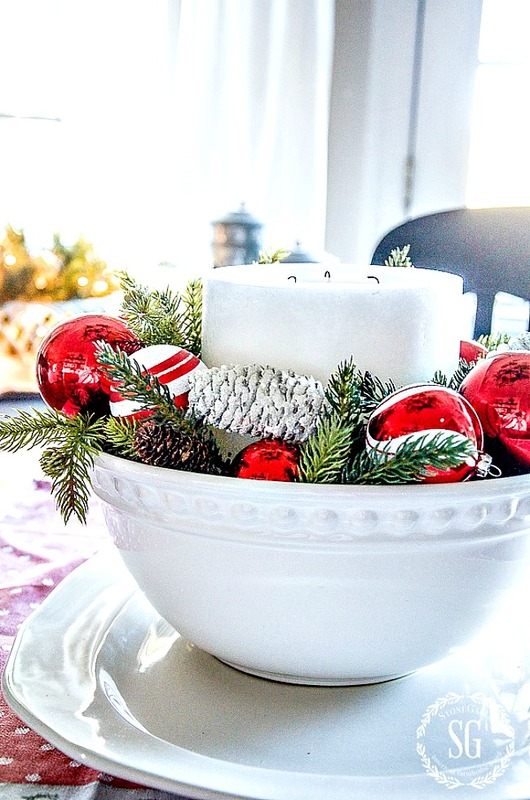 Today on Decorating Tips And Tricks we are sharing a HOLIDAY ENTERTAINING GUIDE with you! We have loads and loads of tips and ideas for hosting all kinds of fun holiday parties!!!! Perfect topic for this time of year! You really need to listen to this episode! LOTS of fun! You can really tell we love parties!!!! Get in the Christmas spirit with us! But one year I just got tired of all the work. There had to be a better way! So I went on a quest to find great faux greens that looked like the real deal! And my search paid off! It was like a Christmas miracle! I had no idea such beautiful faux evergreens really existed! Okay, they did not smell Christmassy but they certainly looked Christmassy… and real! I’ve collected boxes and boxes of live greens over the years. And now I think of myself as a faux greenery aficionado of sorts. 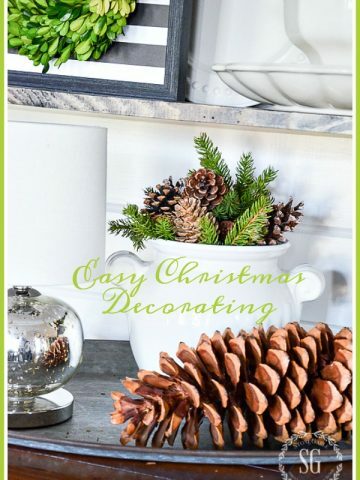 So today we are talking about choosing and decorating with faux Christmas greenery! When I decorate with faux Christmas greens I like to keep it simple and let the greens show off their beauty! 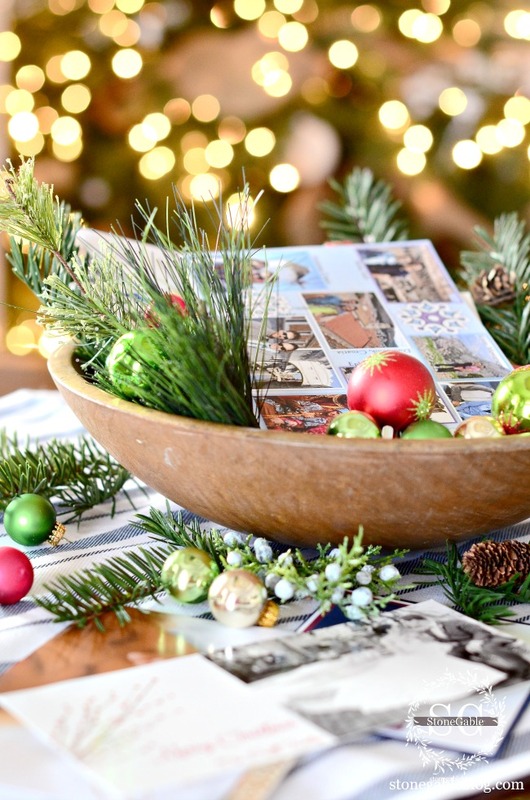 Here are a few tips for choosing and decorating with faux Christmas greens. Real or faux? Hard to tell! These are my go-to faux Christmas greens! Buy the best fakes you can. I know I might get some blow-back when I say this but when you want artificial greens that look as close to the real thing as possible skip the large craft stores. They do have greens but they are usually not the best quality. Shop local decor shop or big flower outlets for the most realistic greens. Or shop reputable sources online. Shop sales! You will be amazed at all the Christmas decor already on sale now. The faux evergreen branch above was $4.90 and I got it on sale for 25% off! Choose sprays of greens that are real life size. If you want your faux greens to look real, they have to be the right size. Think about buying a realistic garland (on sale, of course) to cut apart. You get lots of greenery for the money! Mix different types of greens. When arranging greens make sure to mix a variety of different evergreens and other greenery together. You will be rewarded with a much more interesting and realistic arrangement. I filled the pottery lanterns with a short needle evergreen and a long needled pine. 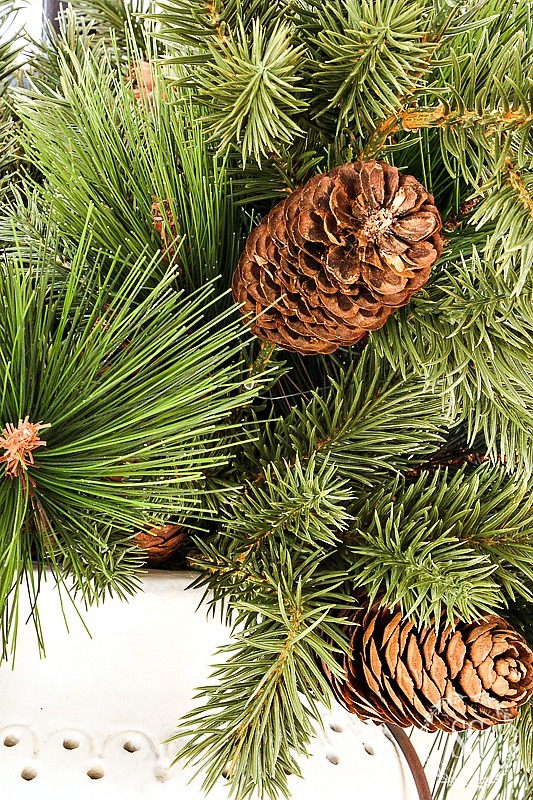 Add the correct pinecone to the type of evergreen sprays. It will make your arrangments look so much more authentic. Fluff, bend and arrange each evergreen branch individually. Don’t just plunk faux greens in an arrangement without “arranging” them. 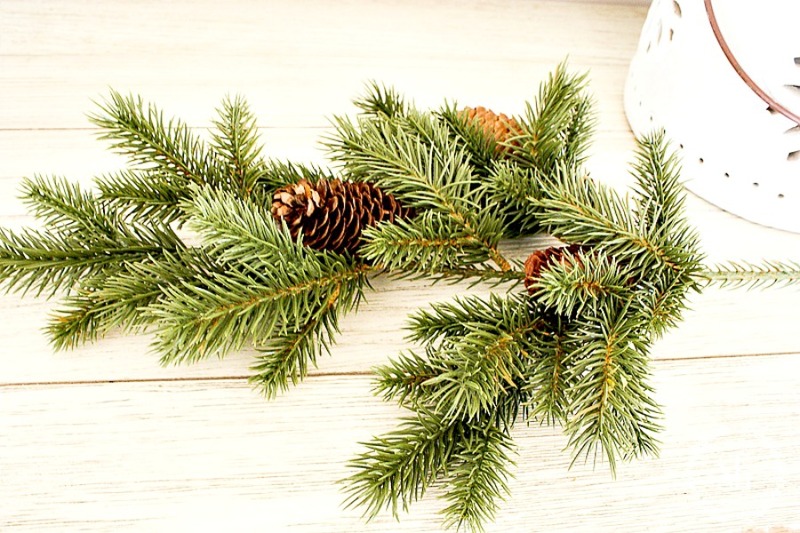 The most popular types of faux greenery are… short needle evergreen, pine evergreen, cypress, boxwood, and juniper. Collect faux greenery little by little. I’ve been collecting high quality (all on sale) fakes for years now and I have accumulated quite a stash. I can now decorate my home with all the greenery I have collected. It takes time to build up a great collection. Add to your collection every year! Choose 3 or 4 different types of greenery to collect and keep collecting just that. I chose a short needle evergreen, pine, and boxwood. It’s so easy to mix and match them! Collect other “add ins”. I also collect red berries, white berries, tiny stars, pinecones (you know my obsession with pinecones), antique ornaments and more! I accent my arrangments with these items but most often I let the greens be the star! Don’t be afraid to cut your faux branches and garland apart. I do this all the time! I save every little piece of green. Sometimes all you need are a couple sprigs of some pretty greens to make something look festive! Take care of your great faux greens. When the season is over swish them in warm sudsy water, rinse them and let them air dry. They collect dust and grime and need to be cleaned. Just make sure they are totally dry before putting them away. Keep faux greens out of direct sunlight. Some of them will fade. Straighten out the stems and branches before storing them away until next Christmas. Store like faux’s together in clear plastic boxes with tight fitting lids. Store them in a cool, dry place. It’s a good idea to wear a light pair of garden gloves when working with faux greens. Like their real counterparts, they can scratch! Decorating with real greenery is quintessential Christmas! But if you are like me, and tired of the mess they cause then you might want to think about switching to fabulous faux! If you do… you won’t go back! *I’ve had so many questions about where I get my greenery. I find them locally. My favorite place for greens is The Old Millhouse Shoppes but they do not carry them online. Check out your local decor shops, they often carry the best and most realistic greens. Did you know that I have a “Christmas” Pinterest board with over 1,200 pins? So many Christmas ideas and tons of inspiration!!!!! Just had to let you know….I finally ordered the punched ceramic white lanterns like yours. I fell in love the first time I saw them on your blog. You were kind enough to give me your source. Waited & watched for a good sale & free shipping….and today was the day! They should be here in plenty of time for Christmas decorating. Thank you!!! 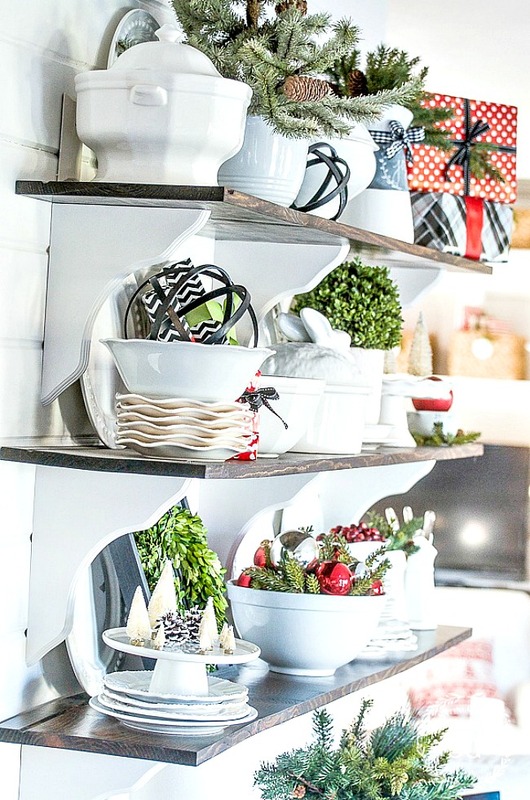 I love your Christmas decor and always great ideas to copy! I have actually bought great looking faux greens in Michaels with berries and pine cones that are quite authentic looking. I mix real greens in! Great to know, Lynn! Thanks! We love to hear great tips for SG readers! Thanks for the great tips ! Your Christmas decor is beautiful, you have given me some inspiration to make some changes with my decorations..
slowly but surely mine is growing ! And totally agree with the glove suggestion! I agree with you. The faux greens look so real that they are easy to use and less messy. Your home looks so beautiful and festive. You convince me to spend more on the quality. I have been very fortunate to have several shops in my area that carry the highest quality faux greens….and I have a great collection of them as I have shopped the after Christmas sales to get the high quality greens at a great price … 50 to 75% off….I do love to mix them too…the faux with the real….love the way you use the greens in your decor…just beautiful!!! 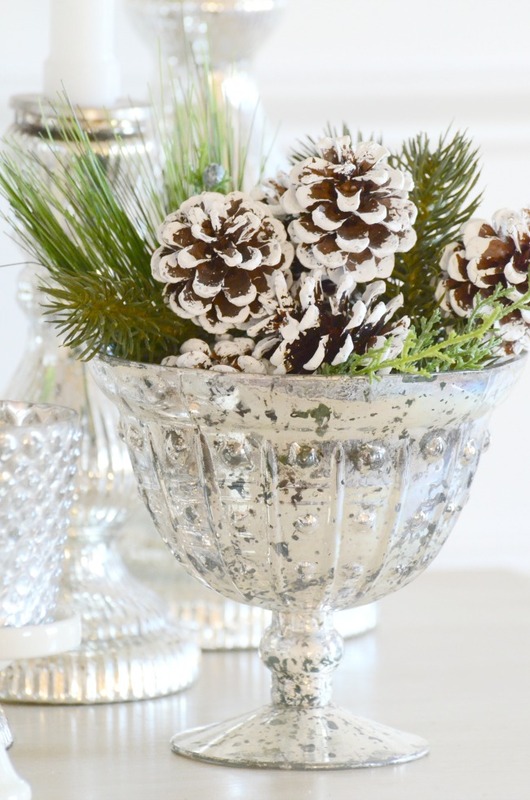 Do you recall where you purchased the silver footed bowl that holds your Christmas greenery and pine cones in the photo up above? Love some of your ideas. Thanks for the inspiration. I love using natural looking xmas decor all around my home. 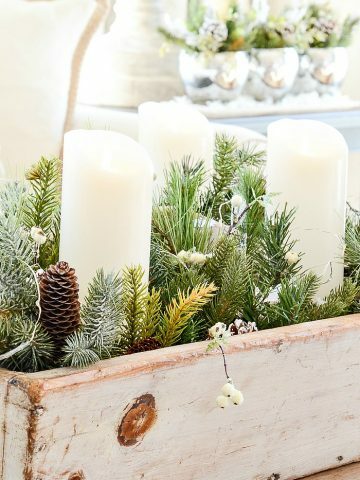 I think that greenery with red berries and pine cones can make anything look special! Thanks for the tips. Beautiful ideas! Now I am inspired to upgrade the greenery on my banister this Christmas. Great tips! I love your greens. They look so real. I always look forward to your tips. If you could give us some online sources for good quality faux greens that would be greatly appreciated. Would you post where there are sale for the fine greenery. If you know. I love using faux greenery because I can decorate early and still have everything looking fresh. You are right about choosing good greenery. I have tried the inexpensive ones and they do not hold up well or look real. No blowback from me about big box store fauxs. I like the most realistic greenery possible. I purchase about 70% of mine wholesale and the rest from boutiques that have great looking faux florals. Not everyone is able or willing to maintain fresh greenery throughout the season, and good fauxs are a great compromise! I’m really good about cutting up some of the stems or garlands to create realistic vignettes. I think you get a LOT of bang from your buck that way! No faux for me. Love the fragrance and look of the real thing. To me, the clean up is just as labor intensive of packing and finding a place to store the faux. What beautiful ideas to get ready for Christmas – complete with the Stonegable touch. Smart and savvy. Thank You Yvonne. We think alike! I feel the same way you do about faux greenery, as long as it is high quality. I am always searching, and it isn’t easy as most of the stores don’t carry anything realistic. I did go the Olde Mill House Shoppe website and they do have some faux garlands that they sell online. I still like to see it in person, as it’s hard to judge it’s quality and feel from a photo. Do you have any online sites that you have purchased from and like? Love the tip about cutting up a garland length greenery to fit your needs. I love to do that too! Merry Christmas! No, but I am looking for some for an upcoming post. I love your idea of mixing faux greens. I do that with my live greens about a week before Christmas. I do a walkabout on my farm in search of various greens and pinecones. For all my faux greens it is usually a trip to the Flower Warehouse! They have everything imaginable. A real Pennsylvania treasure!! I live in PA too! Outside of Philadelphia. Where is the Flower Warehouse? I looked online. Is it called the Flower and Home Marketplace? Yes, it is in Blue Ball I think. Yes, it is. I’m in PA as well, also outside of Philadelphia in Montgomery County. I lived in Lancaster Country several years ago, just a stone’s throw from Flower Warehouse. From what I’ve been told, it is even larger now. I’ve been wanting to venture out that way and take a look for a couple years now. I am a new follower. I so enjoyed the article on faux Christmas greenery. I have been trying to get away from real greenery because of the mess myself. Your ideas on faux greenery were very informative. Thank you so much for your wonderful ideas. Hi Sherri, Welcome to the StoneGable family!!!! Well, I knew how they should look,I just needed to know where?. I will try the smaller shops, I love your style. Your greenery always looks great. Will give this a shot this year and pare down my artificial greenery and replace a few pieces. Would love Balsam Hill, but I just cannot bring myself to spend that much money on a tree…esp when my $150 Walmart tree looks beautiful when it’s all decorated…lol. Thanks for the great tips! Storage is at a minimum in my new home so I use real and throw it in the yard waste after Christmas. The clean up doesn’t bother me, at all. A dust buster makes quick work of it. From reading the previous comments, I guess I am the only one the doesn’t mind a bit of mess in return for the glorious smell and nothing to store after the season. Great tips for those that use faux though. Yvonne, Need your help with something. I am updating decor little by little but I really struggle with balancing things for my style because I like farmhouse/vintage but I do not want everything farmhouse. I guess I like classic pieces with that.What I like about your style is you do incorporate farmhouse but it is not overdone. You balance it. I get stuck and struggle on how to accomplish this. Your guidance is appreciated. Was so excited to see today’s post – I LOVE your Christmas ideas from year to year and was sitting on pins and needles in anticipation of what you would create this year! Oh, it was SO worth the wait! Wonderful, wonderful, wonderful!!!! Thanks for the great tips! I totally agree about finding the best faux greenery at local decor and flower shops. Many of them are so good that it’s hard to tell the difference between the real and the faux. I’m planning to go through my greenery this year and start thinning out the cheaper stuff that I never seem to use, but just leave in the tub for the next year! Good information on faux greens. It is less mess than fresh. One of my favorites is boxwood, I have priced it faux, and it is expensive!! I know Kristy. I didn’t include it in the faux greens category because it is really a living green (or once living). Love these ideas!!! Thank you . You’re thoughts really help organize my mind!!! Those big white ornaments are great, where did you find them? Hi Lorree, those “ornaments” are Chinese lanterns of all different sizes. They are so fun in a tree! Finally a post on Christmas! I have been using your tips on greenery for the last year or 2. It really looks festive any where you put it. There are so many oils, scent sticks, and sprays to get that pine smell that we all crave. Love your ideas and am looking forward to all your Christmas blogs!! I agree, love the look and smell of real greens but not the mess.I have a small collection of faux greens, hard to find realistic looking ones, always searching.Yours look fabulous. Mixing best quality fake with real greenery such as holy has worked great for me. Just put a clear glass in the middle of your container for the real and then add fake to the outside of the container then arrange, intertwine and fluff. If container is clear just wrap greens around the glass inside the container. Great tips, Carolina thanks so much! 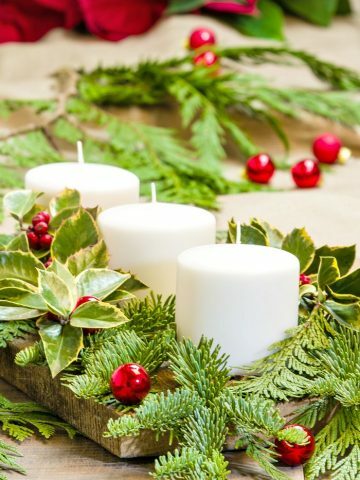 Yvonne, these are great tips for using faux greenery! I love the smell of fresh, but it is no longer worth the mess! I so agree Pam. I’ve found essential oils and use evergreen scents in my diffuser. We ordered new faux Christmas trees from Balsam Hill this year but before we made our final decision we ordered the sample branch box. I now have 50+ tree branches I can use in different arrangements around my home. The sample box is only $19.00 so it a great “cheat” for collecting high quality greenery. Thank you for your blog. Love it. Great tip. Just ordered some! Love, love this! I just ordered some too. Thanks for the great idea!! Great idea! I just ordered mine! Wow, gotta find that deal!!!! I have a Balsam Hill tree and I love it! It will last us until I pass it down to my kids. I love today’s post on faux greenery. It is amazing how realistic some of the greens are now a days. I have allergies really bad and pines are the worst for me ,pretty bad when you raise christmas trees. We now have a faux tree and faux greens in the house. I can hardly wait to start decorating our home. Have a blessed Fall day???? 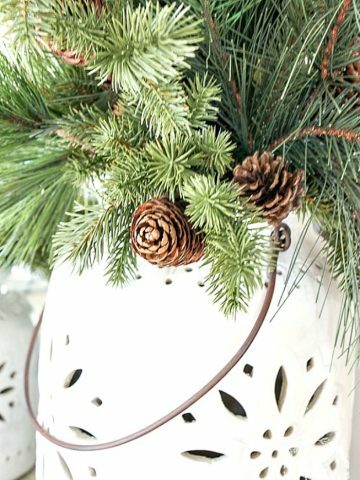 Great tips on faux greenery. Now I need to find some at good prices! I TOTALLY agree with you, Yvonne! Lush, live greenery is beautiful and so fragrant, but when clean-up time arrives, GO FAUX! Stay away from plastic versions, if possible. You are right Bunny! No plastic! As always, wonderful tips on Faux. Beautiful pictures too!! Love to listen to your podcasts. Much thanks for your ideas and inspiration. Christmas is my FAVORITE holiday to decorate for. Enjoy the season. I am allergic to pine and have wanted to use faux greens for a long time. I just can’t get my husband on board. He wants real. Any tips on how to change his mind. I am mildly allergic too and it took me years to figure this out. I was always sick every Christmas! No more! Thank you for sharing your tips on faux greenery! I’ve been collecting for years as well, and then as I find even better looking ones, I will weed out anything old, worn, or that doesn’t look as real and throw away or donate. You can certainly find realistic greenery when you shop the right places, that is so true! And it’s more economical because you can reuse every single year. Sherry, they can be a little pricey but I wait till they are on sale. I collect a little every ear and now I have a big collection! Yvonne, your decorating is always so beautiful! 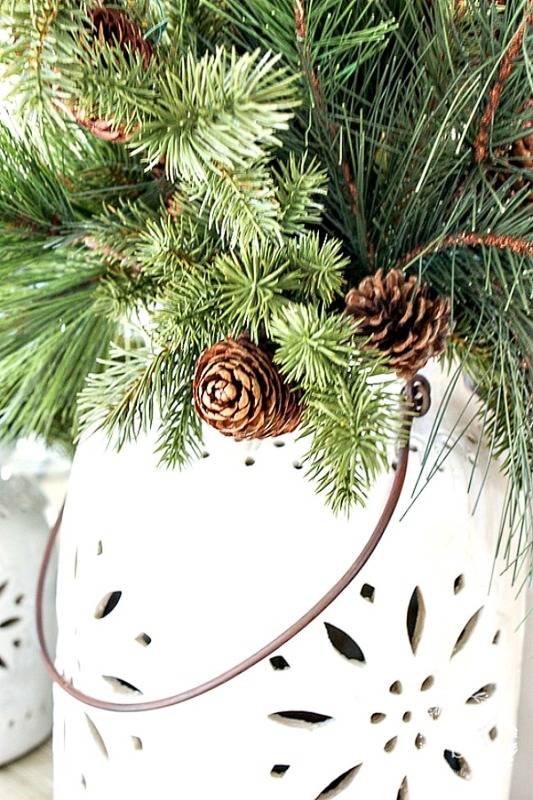 Thanks for sharing tips on how to buy greenery for Christmas decorating. You are so inspiring! Finding good faux greens can be pricey but sales really help. Over the years you can build quite a collection! You are right Deanne! But once you buy them (and I buy them on sale) you have them for decades! Don’t wash anything flocked. Instead use a hairdryer on low and the coolest setting and give it a good blowing over! Berries, I’d use a feather duster. You never know it they will bleed. This Florida gal thanks you for sharing how you use the faux greenery. It’s much too hot here for me to use real greenery because it dies so quickly and makes a mess! Your greenery looks amazing! Thanks for sharing! Love your ideas on faux greens. I am always on the lookout for good quality ones on sale or in a second hand shop. Helps that I volunteer at our church thrift store.We never know what will be donated. Never thought of cutting garlands apart but will try it this year. I will save the real greens for outside decorating and faux inside.With some balsam scented candles no one will ever know! Kathy, I’m thrilled you shared the garland tip! I do that too!And a garland can give you lots of greens to cut apart. I have THE BEST readers!!!! Oh I LOVE the StoneGable girls!!!! Make sure to send me a picture of all of you!!! Hugs to you!!! I’m with you in spirit!!!! Yvonne thank you so much for this wonderful post. The images are so inspiring. Great tips ! For years I have used faux greenery because my husband has allergies. Over the years the “faux” greenery industry has really stepped up and I agree that some looks very very real. I love top quality greens too. 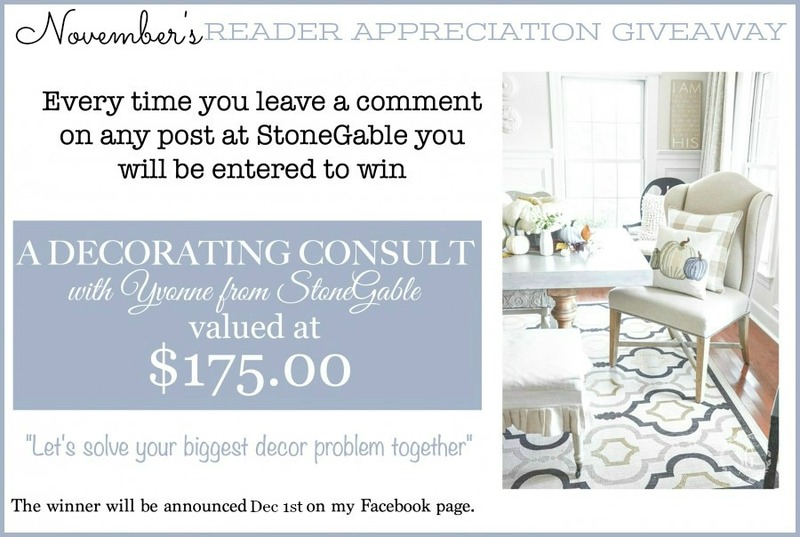 Would love to win a decor consult as well. Now that would be a grand Christmas present. I would love great greens as a gift too!